The Climate Vulnerable Forum (CVF), established two years ago, is finding a place and voice in the international community as a convenor of countries that share one common threat: particularly strong exposure to the effects of climate change. At a side event in Rio on 19 June, ably moderated by the Foreign Secretary of Bangladesh Mohamed Mirajul Quayes, we heard the perspectives of three active member countries, complemented by three expert discussants. Costa Rican Minister of Environment Rene Castro, the incoming Chair of the CVF, reminded us that some member states of the United Nations will lose a certain percentage of the sovereign territory to the slow-onset effects of climate change. This, coupled with resulting forced migration, is an issue of equity and human rights and needs to be tackled as such by the international community. Reliable data is also needed to allow countries to assess the implication of these threats. According to the Minister of Environment of Bangladesh, Dr. Hasan Mahmud (current Chair of the CVF), climate change is already taking a heavy toll of the economies. Vulnerability is not about future scenarios, it is a reality: in his country the slow-onset effects of climate change are already felt in the coastal areas. Rising sea levels and encroaching salinity mean that large zones are no longer suitable for agricultural production. He made a passionate plea to UN member states to include climate change adequately into the Rio Conference outcome text. 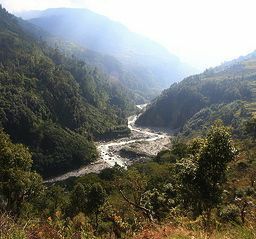 The Minister of Environment of Nepal, Dr. Keshab Man Shakya, described the gradually disappearing snow cap and glaciers in the Himalayas, resulting in flash floods and erosion, and long-term onset of drier conditions and even local desertification. In neighbouring countries, the now-erratic seasonal water flows are affecting the productivity of the alluvial plains. Nepal will assume the chairmanship of the group of Least Developed Countries (LDCs) in the UNFCCC negotiations and will be an advocate of mountain issues through that channel. Invited to speak as an expert discussant, I highlighted the importance of making long-term development planning both climate-smart and evidence-based. CVF members will need to ‘climate-proof’ their future infrastructure investment plans particularly carefully in order not to lock themselves into high maintenance costs and shorter-than-planned shelf life. I encouraged the Forum to engage with International Financial Institutions for catalytic funds to support projects that they have already initiated to decrease their vulnerability and to transform their development into a low emissions pathway. Dr. Saleemul Huq, Senior Fellow at the International Institute of Environment and Development (IIED) put a positive spin to the aspirations on the CVF – instead of engaging in a “negative beauty contest in vulnerability”, the Forum can be a vehicle to foster the concept of adaptability. The members should be encouraged to continuously share best practices and successful examples to inspire each other. Helena Molin-Valdes, Director of the UN Office for Disaster Risk Reduction (UNISDR) suggested a strengthened focus on resilience and encouraged CVF members to address the serious vulnerability issues in rapidly growing urban areas. The CVF can, she said, “think local, and act global”. The CVF clearly understands that it should not create another grouping for climate negotiations. Its members are already active in the various existing interest groups for mountain and island states, Least Developed Countries, etc., but the real value added for CVF is the opportunity for sharing experiences in responding to climate challenges and finding common issues and responses which they can advance further through their own constituencies. DARA, CDKN, IIED and others – who are currently supporting the CVF—will be welcome partners to support them in doing this. The panel concluded with an informal thought of renaming the group as “CVF – Climate adaptive and resilient countries”, to demonstrate their collective spirit of action and leadership in the quest for climate compatible development.